Many people have read or heard of Joshua Lawrence Chamberlain’s actions at Gettysburg. Glorified in the movie Gettysburg, the current myth about this legendary man is that he single-handedly saved the Union on Little Round Top. His leadership played a crucial role, but it is an exaggeration to claim that he alone saved the Union. Chamberlain wouldn’t have supported such a statement; in his writings he constantly gives credit to the men under his command or comrade regiments. (You can read this blog’s biography of Chamberlain here: Part 1, Part 2, Part 3). This photo was taken in 2008 at Petersburg National Battlefield at Battery #5. NOTE: This not Rive’s Salient. 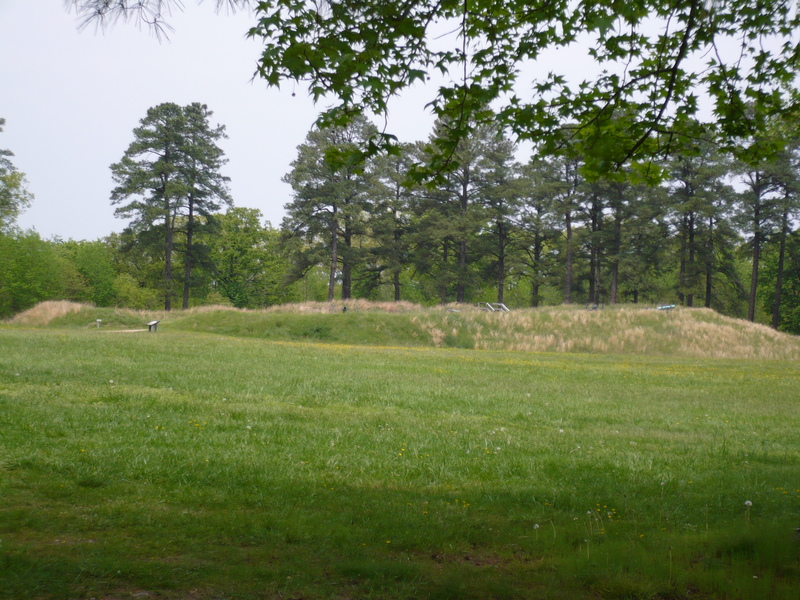 This picture is included simply to show Petersburg Battlefield as it appears today. In front of his Union brigade lay an open field leading toward a well-fortified salient of earthworks and cannon held by Confederate troops. Orders came from General Grant’s headquarters to attack this position. Chamberlain was no stranger to frontal assaults. He had co-led one at Fredericksburg with disastrous results, he had fended them off at Gettysburg, and he had watched numerous charges in the last weeks of the Overland Campaign. He sent a letter back to headquarters, respectfully stating his opinion that this charge wasn’t going to work. The answer from Grant: do it anyway. He could’ve made an excuse and stayed behind like other officers – he’d been ill in the spring, the campaign had been tiring . But Chamberlain’s leadership standard was “come on” – not “go on.” With full knowledge of looming failure and that he would be in constant danger, he prepared to lead the attack. Not only would he lead, he would ride into the deadly storm on a tall horse, which would make him a conspicuous target. 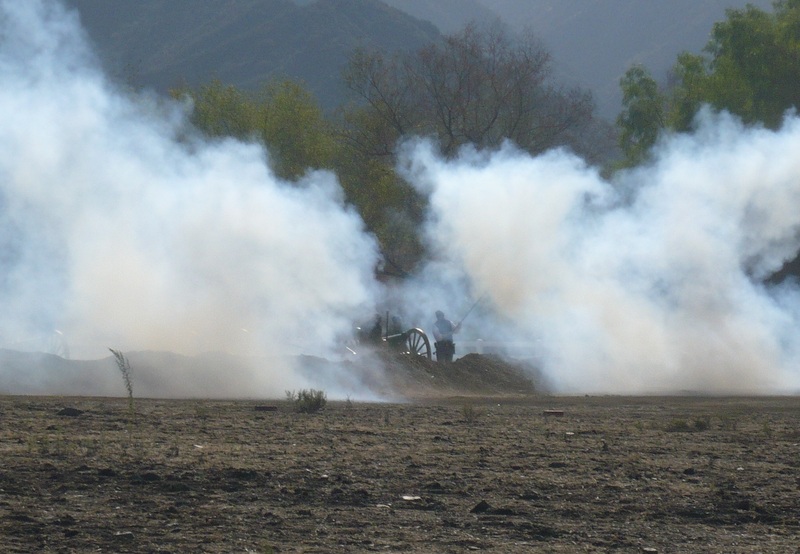 After some initial preparation and cannonade, the brigade moved to the attack. Chamberlain’s horse was shot; he continued on foot in front of his command. The flag faltered as the flag bearer was killed. Chamberlain seized the banner and marched on, sword drawn. The earth exploded around them. Men were falling. He knew this would be what would happen, but he marched forward. As they neared the Confederate position, Chamberlain realized that they would be marching through a bog, which would slow the attacking speed. He halted, half-turned toward his men and motioned them to go on either side of the boggy ground. As he gave the directions that might secure more safety for his troops, Chamberlain was shot. The troops were still advancing and he determined that they would not see him fall. Handing off the flag, he used his sword as a prop, leaning on it, until the last soldier had gone past him. There was nothing more that he could do; the pain and loss of blood soon brought him to the ground where artillery shells tossed dirt on him as he listened to the disaster unfolding for his men. They were repulsed. His aides dragged him out of the danger zone, but left him on the field, unable to move him any farther. Later, Chamberlain was carried from the field by four stretcher bearers, who deliberately disobeyed his orders to leave him alone and care for the other men. This insistence continued at the field hospital, but the surgeons did not listen. However, the soldiers who were near the operating table when Chamberlain was brought in never forgot his unselfish plea that they be attended before him. The wounded warrior was still exemplifying leadership in a situation where men of lesser character would have been crying for help or screaming for pain relief. The first surgeon to examine Chamberlain’s wounds pronounced that they were mortal. Basically, a minie ball had entered at his lower right hip and tore upward toward the left hip, causing extensive internal damage, including broken bone and lacerated organs. The medical field was still in its “Dark Ages” during the Civil War and gut wounds were almost always fatal; by the medical standards there was nothing to be done and Chamberlain had no chance of survival. Thomas Chamberlain, a younger brother, refused to accept a single opinion and found two skilled surgeons who re-examined the colonel and agreed to try surgery. Anesthetic, probably chloroform, was available, but at some point in the crude surgery, Chamberlain was in so much pain that the surgeons were afraid to continue; he insisted that they proceed and they eventually succeeded in somewhat repairing the internal damage. Within the twenty-four hours after his wounding, Chamberlain scrawled a penciled note to his wife, which must have broken her heart when she received it. He admitted that he was probably mortally wounded but reiterated a statement of faith and the belief that he was going to heaven. He thanked her for her devotion and begged her not to grieve too much for him before closing with a whisper that he would always love her. He was moved by stretcher and hospital ferry to a base hospital in Maryland. General Grant send a death-bed promotion and the newspapers started printing General Chamberlain’s obituary…too early. With care and motivation from his family, Chamberlain fought for life and eventually recovered. He would return to fight with his soldiers in the final campaign of the war, but for the rest of his life he would suffer complications from the shot at Petersburg. Why Petersburg and Rive’s Salient as Chamberlain’s finest leadership moment? Because he knew what would happen. He exhibited proper care by asking for a higher military command to reassess the situation. He led the attack with the flare and appropriate charisma of a strong leader and he was so determined to be that example that he managed to stay upright after suffering a shocking wound until every soldier had rushed by him. Unselfishness is a large part of leadership and Chamberlain displayed this quality throughout the trauma and field hospital experience. Love for his family, and especially his wife, comes into the war scene as he grapples with the reality that he is likely dying and he searches for the right words to convey his faith, thanks, and love to the most important woman in his life. Why Petersburg? Because there, Joshua Lawrence Chamberlain gave the ultimate example of leadership in the vanguard, in the field hospital, and in a scribbled note to his loved ones. P.S. Just my thoughts here in this post. So what do you think: Gettysburg or Rive’s Salient? Or another battle? Share your thoughts in a comment. You’re welcome! Glad you liked the information. It is hard to choose between or rank any of Chamberlain’s heroic feats as there are so many and each is so striking. Rive’s Salient is perhaps his personal best for courage knowing what he knew but his leadership at Gettysburg is likely more significant in terms of how he got other men to do the impossible in the face of death. It is also too easy to overlook his performance at Quaker Road given how he had already cheated death but was certainly just as convinced he would die that day as he rode down the road directly into confederate fire and kept fighting after being hit in the chest and losing his horse from underneath him. Truly an amazing human being.